Newly constructed in 2019! 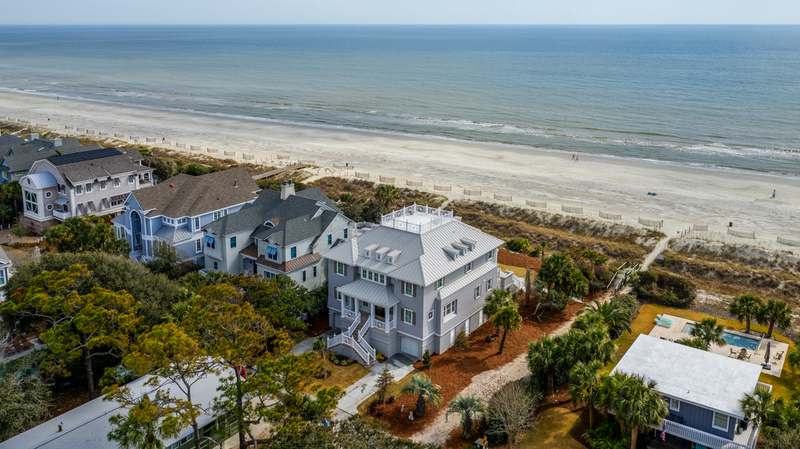 Whether walking through the grand entrance or standing on the back veranda, the views from this beautiful OCEANFRONT home are breath taking. The gorgeous foyer with its white washed brick flooring, open handcrafted staircase and one of a kind lighting is the first thing you see when entering this home. To the left of the staircase, is a luxurious master suite and spacious laundry room. To the right, you enter the dining room where everyone will want to linger. You will enjoy the ocean views as you go straight ahead into the main living area and kitchen which opens to the dining room. On this level is a large, oceanfront balcony overlooking the pool and spa. Up the elevator to the next floor there are 4 additional bedrooms; 2 king suites, queen suite with 2 queen beds and a bunkroom with a private bath. Watch the waves roll by as you float in the pool or sun bathe on the back patio. The outdoor living space in this home is second to none. Every stunning detail of this home is sure to WOW you and your family and will be the perfect home for your next family vacation! •	*Pools can be heated at an additional charge. This pool has a gas pool heater. The cost per week is $575-$878 (depending on the season) to heat Pool.